Two Chimps in the Woods – Handpresso – Espresso Anywhere! If you love coffee, one thing you’ll have tried is an espresso. That small, dark shot of caffeinated goodness. A morning elixir to bump start your body or a mid-afternoon pick me up. Either way, you’ll know just as well if you’ve had a demitasse of bad espresso. Either brewed incorrectly, ground poorly or made with plain bad coffee; it might have been enough to put you off. Fear not troop as we’re about to put the proverbial cat amongst the pigeons. This award-winning brewing device is right up my street. It’s compact, it’s easy to keep clean, it’s robust and most importantly it makes amazing espresso – Anywhere! If you are like me and you travel, or maybe just enjoy the outdoors, you’ll appreciate the ethos and concept of the company Handpresso. With many models to choose from, including a really cool 12v vehicle version, the Handpresso Pump is where it all began. Fittingly known from the outset as the ‘Handpresso Wild’ this device has revolutionized the portable espresso. Utilising nothing more than your hands, you can generate 16 bar of pressure using the bicycle pump style cylinder. Add your hot water (50ml) to the bowl, add your coffee basket, fit the nozzle and presto – espresso! This device is reassuringly heavy (480g) giving a real quality feel. All of the parts are robust, stainless where required and most importantly really, really simple to use. For this review, I took the Handpresso pump into the woods on one of my short trips where the weight of my pack was not too important. Part of what drew me to the Handpresso was the companies’ mindfulness regarding the environment. The way you build pressure – human. The waste – simply your used coffee grounds (no pods or other errant plastic packaging). The only environmental impact would be from how you choose to heat your water. For this trip, I’m using the Solo Stove. They are designed with a double wall, so the Solo Stove is a natural convection inverted down gas gasifier stove. The air intake holes on the bottom of the stove channel air to the bottom of the fire while at the same time, channeling warm air up between the walls of the stove. This burst of preheated oxygen feeding back into the firebox through the smaller holes at the top of the stove causes a secondary burn which makes it super-efficient. I can boil enough water for a brew with just a few twigs. I’ve got some amazing coffee to try with this device – Tiny Horse lends itself to this brew method and I’m stoked the guys at Two Chimps picked this coffee out for me. Ground fine for an espresso, this stuff smells amazing when you open the bag. The basket of the Handpresso is quite small and holds just a couple of spoonfuls of grounds. You’ll need to ‘tamp’ the grounds down into the basket and clean any excess from the rim. The handle has a rotary lock to keep it in place while not being used. A slight twist and you will feel it release, Handpresso recommends a certain grip to be most efficient and I found it worked well. Add hot water to the bowl until you just cover the basket holder. Too little and you won’t fully wet the grounds leading to a poor extraction, too much and there will still be hot water inside when all the pressure has gone. Add the basket carefully and then fix the filter nozzle. Flip the device over, place the nozzle over your chosen receptacle and press the button to hear that all familiar and wholly satisfying whooshing noise as the grounds give up their beautiful flavour. It’s not too much trouble to make a double by repeating the process. The parts of the device stay cool enough to handle immediately after your first brew and if you want a long coffee maybe make a double and top it up with water to your liking as I’m doing in my trusty tin mug. Either way, you’ll be enjoying a caffeine-induced euphoria soon enough! Ahh, finally. Espresso. 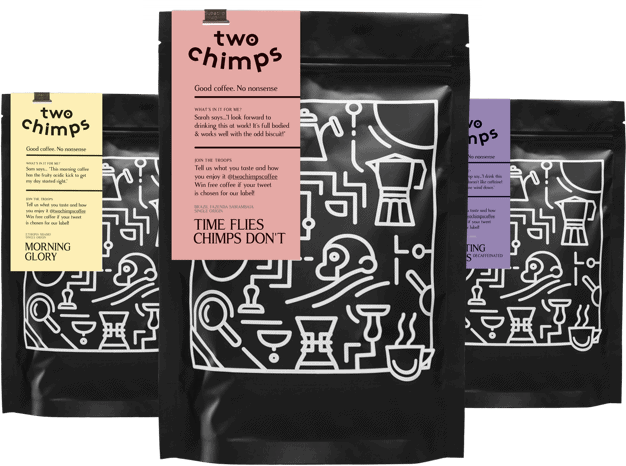 Anywhere – Thanks to Two Chimps Coffee. Good Coffee – No Nonsense. Want one? They are now in stock!